Design dilemmas come in all shapes and sizes (literally) – some have the challenge of too little space, some have strange nooks and crannies which can be awkward to deal with… Today, we focus on large living rooms and, specifically, large living room layout ideas to make the most of your capacious lounge (lucky you!). You may be wondering what to do with your extra living room space or perhaps you’ve filled the space quite well but you’re looking to create a cosier atmosphere. We discuss large living room ideas from how to work colour to your advantage to must-have pieces. First things first, there are a few tricks for making your space much more manageable. Why worry about handling one large living room when you can effectively divide and conquer? Other examples of popular living room zones are a reading nook, a craft or hobby area, a games area or an intimate eating area. The most commonly used technique for decorating a large living room is to create two separate seating arrangements – that’s because it’s almost impossible to fill any large space with a single one. Think about it. You have a large living room which is 30 feet by 15 feet. It would be very difficult to find furniture for one seating arrangement which would be large enough to effectively fill that space, not to mention that the dimensions and proportions would most likely be very unnatural. Creating two furniture arrangements provides lots of extra seating, allows a living room to be used for multiple functions, sometimes simultaneously, and avoids the risk of dead space or those tricky empty living room corners. When arranging living room furniture in a large space, remember to be generous with your spacing – even more than you would be in a smaller space. The goal is to have pieces close enough that they feel cohesive and allow for a natural conversation (no more than 10 feet is the general guideline) but far enough apart that there’s breathing space between each element. Don’t be afraid to allow for larger gaps between chairs and side tables or table lamps, the sofa and coffee table (although it still should be within arm’s reach; the recommended distance is 18 inches but for a larger space you can go a little wider) and, definitely, between furniture arrangements. You have the freedom to have wider passage areas between seating areas too (with simply the addition of a centre table to bridge the gap between two arrangements) so use it. Room dividers, in all of their forms, have the ability to visually break up a space making them a great feature to use when decorating a large living room. Dividers range from non-permanent pieces like a chic centre table, as mentioned before, and beautiful coromandel screens to dividing bookcases and built-in shelving units. Both have their pros. Something like a centre table, low bookcase or screen can be easily moved around the space, opening up the space for larger gatherings, or moved to another room if needed. A tall bookcase is a good middle-of-the-road solution – it provides quite a lot of separation (although an open bookcase will still allow for some interaction between the spaces) but can, technically, be moved if needed. A floor-to-ceiling built-in shelving unit is something which would be an architectural feature inherent to your room’s design. It would be a permanent feature of the space which would certainly break up a large living room. As with a shelving unit, there are some elements which can be included as integral parts of your space. If you’re involved in the design of your living room from the beginning and have the opportunity to request more permanent architectural changes, a split level really helps visually and physically break up a space. You might choose to have one area designated as the more formal living room area and the other as the informal lounge area or have the lower area act as a cinema space. Before you choose your furniture, here are a few foundation-level tricks to help you decorate your large living room. Mass is one of the many all-important elements of design and an important thing to consider when decorating a large living room. It comes in two ways – both of which are important. There’s mass in the sense of volume and massing by quantity. Mass (volume) is the physical (actual) or visual (perceived) size of an object. The larger the space, the larger the pieces in it should be. We’ll get to that when we talk about oversized furniture pieces. Massing is a smart way of grouping a set of objects so that they appear larger – also important when decorating large living rooms. Examples are a gallery of art pieces, a cluster of chandeliers hung at different heights or a group of armchairs. Use mass and massing to emphasise the size and impact of your large living room’s pieces. We love a deep blue living room created using a luxurious grasscloth wall covering, a sleek matte black living room or a special teal hand-painted wallpaper. Darker natural wood panelling works well here too. Similarly to colour, texture can really alter the perceived size of a room. Glossy, polished finishes with no interruptions give a sense of seamlessness and continuity, as if they could go on forever. Textured finishes, on the other hand, whether actual or implied, can create depth and will appear to advance much like deeper colours. Textured wallpapers or custom wall or ceiling finishes such as murals, panelling or coffering work very well in drawing a room’s proportions in. Now that you’ve considered some early-stage large living room design techniques, it’s time to start furnishing and you should think about some key pieces which will help fill the space well. These simple fixes will have your large living room feeling well-designed and cosy in no time. Designers often have to come up with ingenious solutions for their projects with extra-generous square footage. 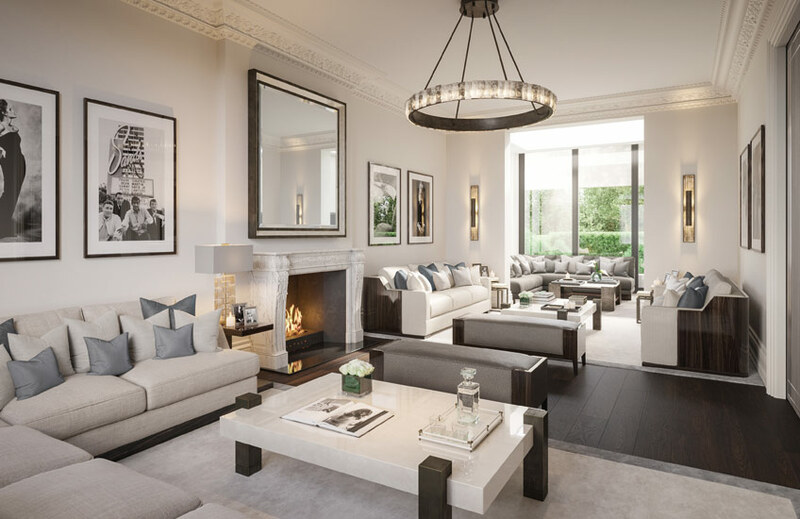 One favourite way to deal with large living rooms is displaying matching double coffee tables side by side. Join the ranks of Kelly Hoppen, Katharine Pooley, Elicyon et al and double up on your living room seating’s anchor point for double the impact. Whether it’s two matching designs, two nesting coffee tables or two interlocking pieces, the effect will be on-trend and practical. “We like to design a pair of mirrored coffee tables that work as a set for large seating arrangements,” explains Cecilia Halling of Elicyon. We love the look of two perfectly matching low and casual wooden coffee tables in a rustic setting, a pair of barely-there metal coffee tables in a modern space or two button-tufted ottomans in an elegant sitting room. One word of caution, this look tends to work best with angular coffee tables (although some circular coffee tables may also work) and non-statement piece designs. Two of these might be design overkill. In smaller spaces, built-in cabinetry can either be too overpowering or inappropriate if there simply isn’t enough space to dedicate to such large-scale pieces (that’s when freestanding furniture which is physically and visually lighter comes into play). A large living room can handle built-in cabinetry and a lot of it! Custom cabinetry can line an entire feature wall (usually a media wall so that it can house the TV as well) from floor to ceiling or used to built out niches in a large living room. It’s the smartest way to create a flawless, composed look because everything can be hidden away behind its doors. Open cabinetry which can be lined with LED lighting and filled with decor is another popular design choice by interior designers. You may not need them but extra side tables are a great way to fill the corners of your furniture arrangement or the spaces between armchairs. Even if they’re not necessarily needed or regularly used, they make sense in the ensemble and will give your space a sense of “rightness”. Another option is to fill empty spaces in your seating arrangement with floor lamps. Alternate between side tables and floor lamps for a varied look. Some furniture arrangements are perfect for smaller spaces because they allow easy access and their open composition appears larger than they actually are. Box-shaped furniture arrangements, on the other hand, are most definitely made for large living rooms, however, mainly because they require quite a lot of individual furniture pieces to fully complete the arrangement and lots of spacing in between. Using a box-shaped furniture arrangement is one way to fill your large living room in a snap. Along with key pieces, there are furniture choices which you can afford to go big and bold on for a large living room. Oversized furniture and accessories won’t overpower in a large room and will fit its proportions much better than small items which will appear insignificant in a huge space, negatively affecting their impact. The most obvious solution to for decorating a large living room is to source a large sofa or an oversized sectional. This is a living room’s main furniture piece and a small or ill-fitting sofa in a large room will not work well, nor will it maximise the space you have available. Do as most designers do and create a custom sofa designed exactly for your space. This will allow you to choose all of the fabrics, finishes and details of your piece but it gives you the chance to think about what your space really needs and make it. Perhaps your room calls for a very long sofa with an angled chaise; maybe you need something a bit more unique than standard sofa shapes to fit into a grand bay window; or you may need a wraparound sofa. Almost whatever you can imagine, can be made. Learn more about finding the right sofa for large living rooms or our custom design services here. When it comes to big rugs for living rooms there are countless offerings (not to mention custom creations). If you really want to dress your large living room well and your budget allows, choose a rug which will cover the entirety of the floor underneath your furniture arrangement. If you have multiple furniture arrangements, use multiple rugs large enough to host each individual setting. This clever design choice will subtly break the gaps between the walls and the furniture arrangements, making them appear less wide, as well as visually separating the two areas. Using the texture and colour techniques previously mentioned is another way of having a large lounge rug make an impact. A vibrant emerald oversized rug will appear to visually fill a space better than a muted neutral. Great examples of large pictures for living room walls include John-Richard’s Chen Qi’s Gilt and Charcoal painting, Eichholtz’s Set of 8 Travelling Prints and PICTOCLUB’s Racing 2 Oil on Canvas. The options of large wall mirrors for living rooms runs from simple modern designs to over-the-top statement mirrors. They can be used to brighten a living room, reflect interesting parts of your room (like a statement wall or unique panelling) and fill a large wall space. Just make sure not to place them anywhere where it might inadvertently accentuate extra space. In the same way that placing a mirror opposite an open archway or a window suggests more space in a small space, doing the same in a large space will make your room feel even bigger. Even if you decide not to do a double coffee table, a bigger coffee table is still a good plan. Load it up with lots of decor items (again, massing is your friend in large spaces), coffee table books and flowers for a unique and eye-catching display. When choosing your living room’s main light feature, the rule of thumb for the perfect size is the sum of the length and width of your room converted into inches. So, a room 20 feet by 25 feet would be best to have a chandelier or light fitting which is 45 inches in diameter, give or take. 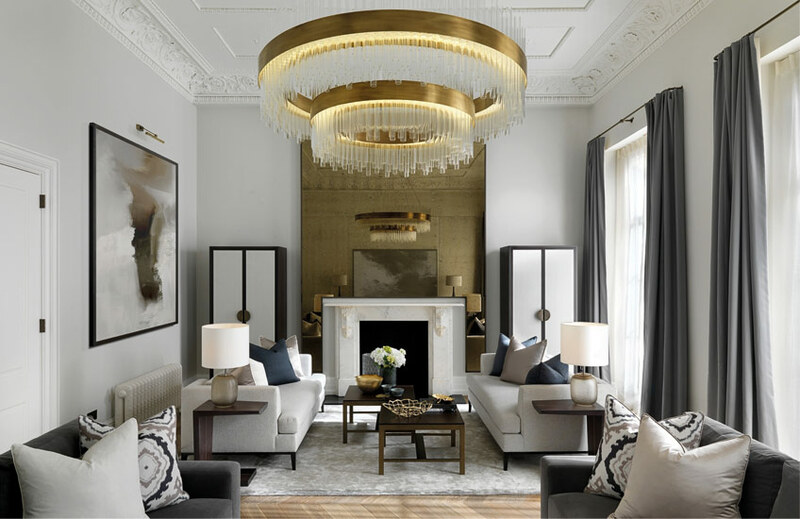 Similarly, the correct height for a large living room chandelier is 2.5-3 inches for every foot so, if your ceilings are 9 feet tall, the best chandelier height for you would be between about 22 and 27 inches. In large living rooms, echoing can be a big problem so soundproofing will be your main goal. 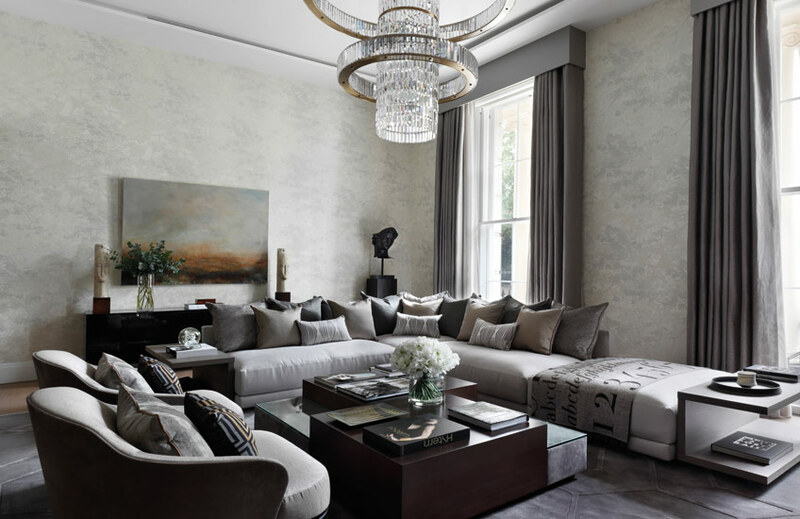 “Layering luxurious textiles and soft furnishings makes a space feel luscious whilst it also creates an ideal acoustic environment” says Cecilia. Other easy fixes for preventing echoing in large rooms are using carpet or adding rugs to hard floor surfaces, installing drapes, filling the space with more items and hanging artwork, tapestries or installing a fabric wall covering. Without getting too technical, you’ll need around 20 lumens per square foot. If you’re involved in the planning process, work with your contractor, electrician or designer to calculate how many lights you’ll need; if you’re working with an existing property, calculate how many lumens you have and make up the difference with accent and task lighting. For more information on lighting, read here. A large living room needs an appropriately eye-catching focal point. 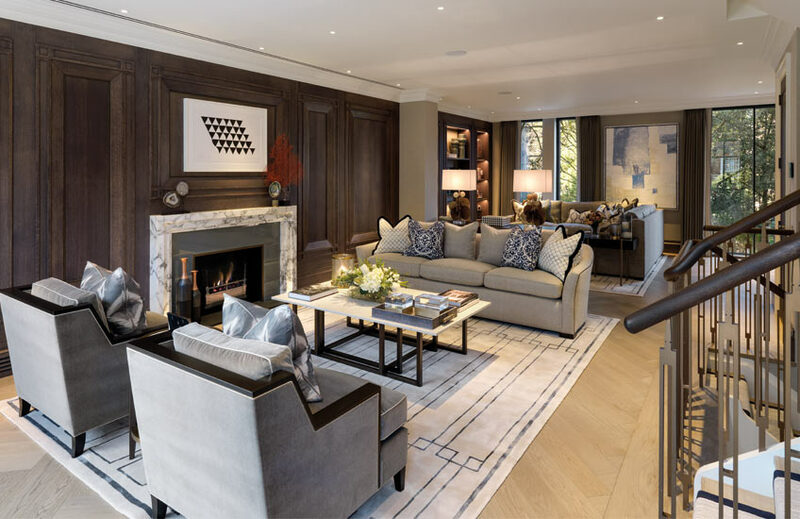 Some rooms have very obvious focal points – a fireplace wall or a bank of windows with a view – but, for those that don’t, their absence can emphasise the sheer size of a large living room and can make for a very boring space. If your room doesn’t have one, create one with a large canvas or mirror, a statement wall or wall panelling.